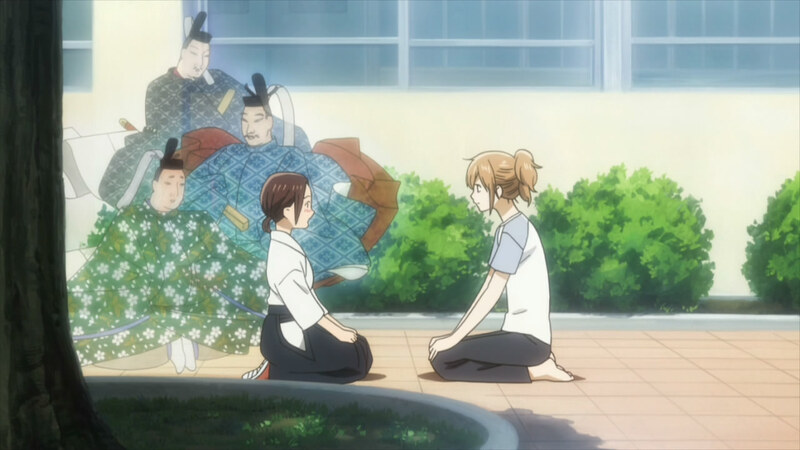 If you were worried that Chihayafuru was getting a little too melodramatic after episode 5, this week’s effort should be a welcome change. It’s a return to the innocent, childlike exuberance of the first three episodes – and damned if it didn’t actually get me interested in Karuta a little bit, too. I really have nothing but praise for this ep, so apologies in advance if you’re looking for criticism. I know this style of series isn’t going to be for everyone, but I love stories that look at the remarkable exuberance teenagers are capable of without ignoring the emotional roller-coaster adolescence can be. 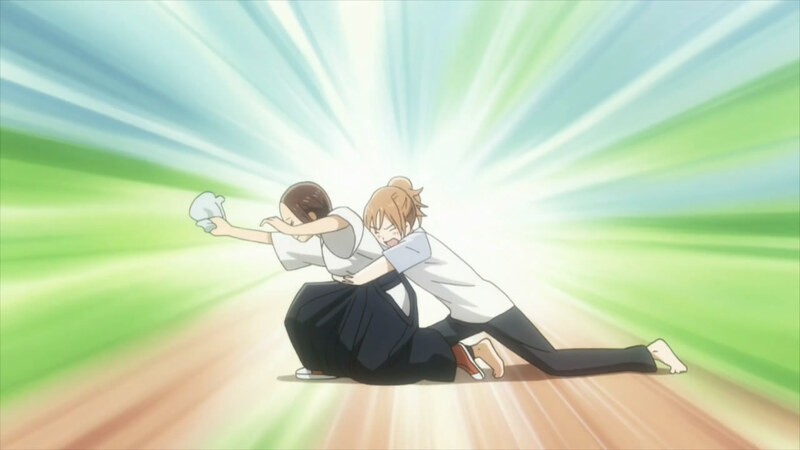 Other than the one GIANT ARATA FLAG at the very end, the bigger issues of relationships were set aside and the story turned to the wonders of the everyday, as Chihaya and Taichi struggle to get their Karuta club started. We’ve certainly seen the club-founding saga played out many times before in anime, but this was an awfully entertaining rendition of a familiar old song. Much of the narrative focus of the episode centered on the girl we briefly met at the close of 05, Oe Kanade (Kayano Ai – very, very busy at the moment). She’s a spark plug of a first-year student, a member of the archery club and a lover of old books. 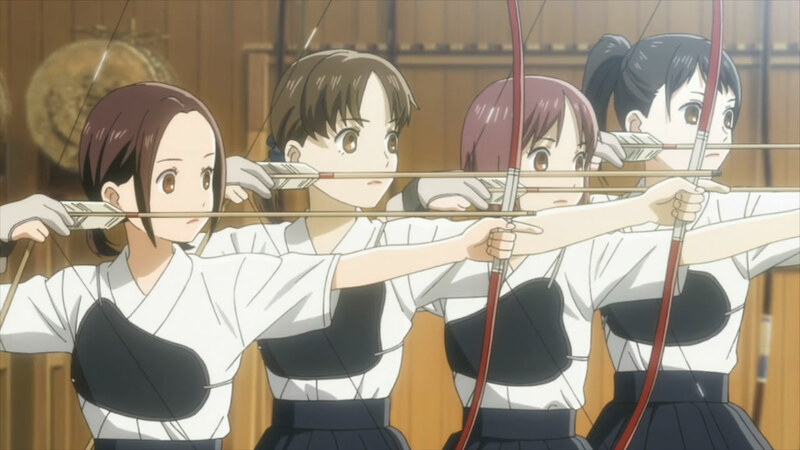 Problem for Oe is, she’s not interested in archery or athletics – she just likes wearing the hakama, the traditional leggings archery club members (and kendo members, and Miko) wear. Turns out her parents run a traditional clothing store and Oe is a hard-core traditional attire otaku. She’s also a lover of all things traditional, including old poems and the story behind them. Kanade is a wonderful additional to the cast, not just for her relentless energy and unapologetic geekiness but because she’s able to cast the by-now familiar – to us, and even more so to to Chihaya – game of Karuta in a new light. Yes, she only wants to play if she can wear the hakama during matches, but she also loves the poems themselves and the stories behind them. To her the hundred poems are living pieces of Japanese history, each with their own backstory and subtle interpretations. 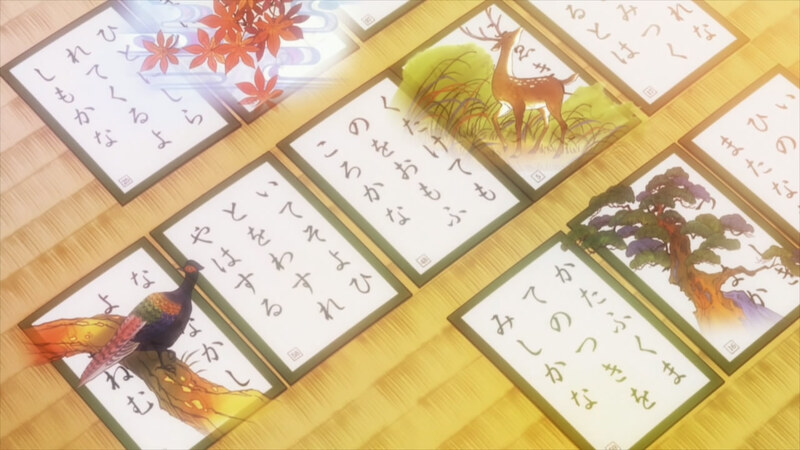 While Taichi feels this esoteric approach is ill-suited to playing the game competitively, Chihaya soon finds that a knowledge of the poems themselves and not just their opening syllables is crucial to getting better at Karuta. 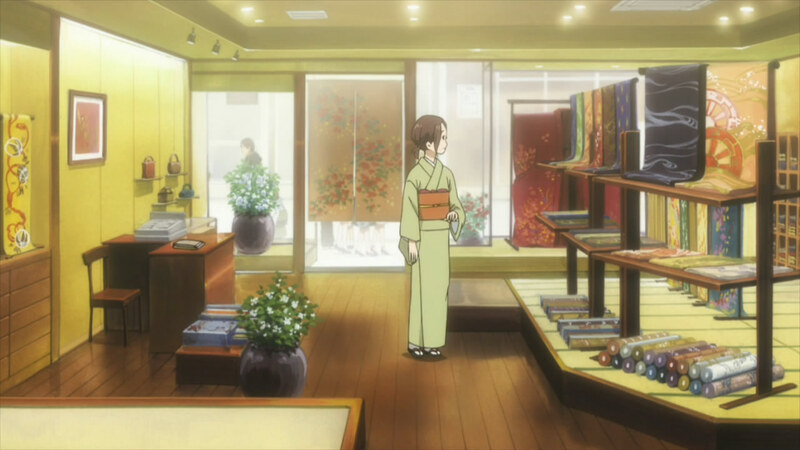 In a wonderfully written visit to Kanade’s family shop, she gives Chihaya a lesson in the history behind the hundred poems. 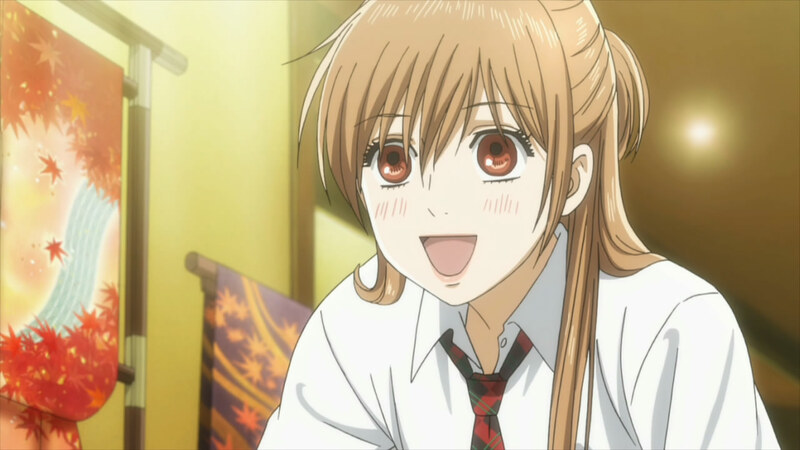 In this way, Chihaya finds she can do what Arata told her she should – “become friends with the cards”. She also hears an interpretation of her own “Chihaya Full” poem that differs from her own literal one, that it referred to beautiful scenery. Kanade’s reading is much deeper and more emotionally profound, that it was a poem written as an ode to a beautiful but unattainable woman, with the adoration disguised as praise for the delights of a natural setting. Of course it was Arata who brought this poem to Chihaya’s attention and decided that it “belonged” to her , so you can interpret all this in a number of ways – in any event, it’s certainly significant. 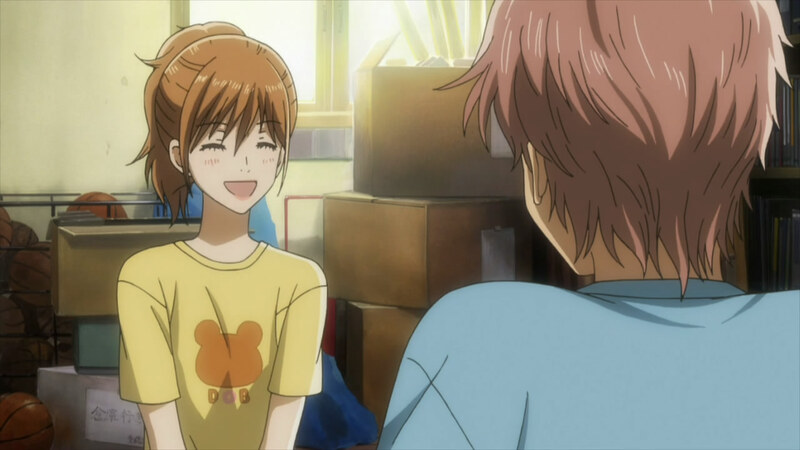 Taichi asks Chihaya quite rightly if she’s serious about coming a Karuta Queen – her motives for forming the club and pursuing Karuta are critical factors, not least to him. Taichi’s quite pleased to have the “club” just be the two of them, but does she really want to get better at the game, or is she using Karuta as a way to pursue Arata? 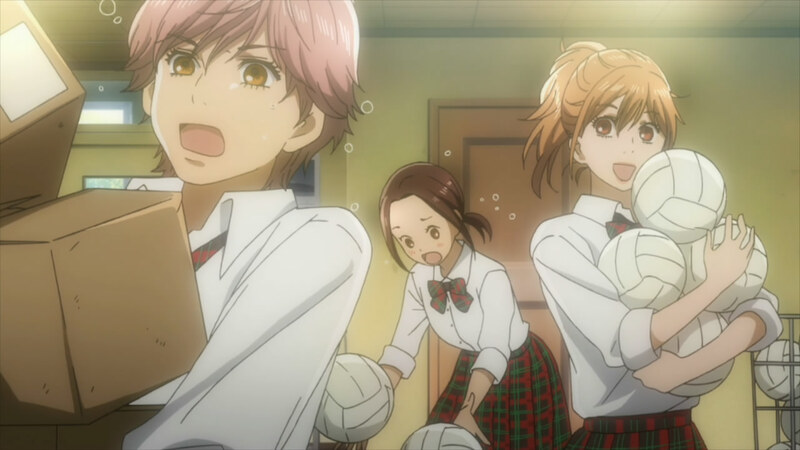 In any event it was lovely to see the different ways each kid sees the sport: Taichi hasn’t played much and his skills are rusty, but he clearly has a detached and strategic sense for the game, easily identifying Chihaya’s weakness after one match. 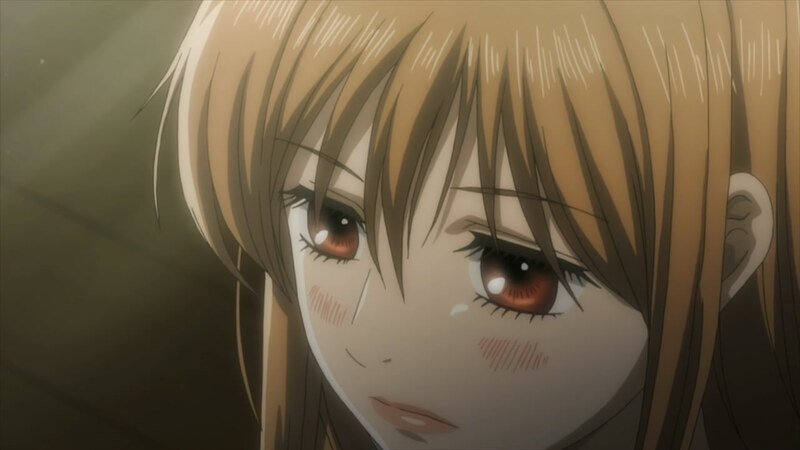 Chihaya relies on her senses and pure instinct, willing herself to succeed through her sheer passion – the same passion with which she tackles life, pulling boys off moving bicycles and running headlong into glass doors. And Kana-chan loves the game for what it represents – a bridge to a past she sees as precious and worth preserving, even if it causes her to be mocked as having been “born in the wrong age”. 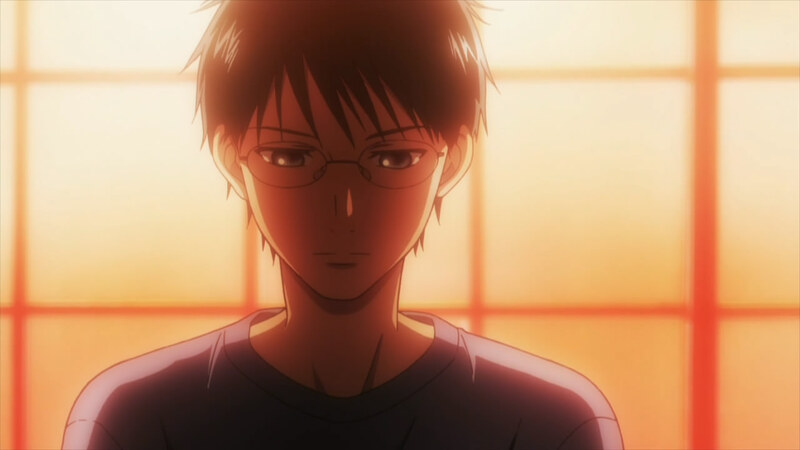 And then there’s Arata, who’s love of the sport is inexorably linked to love of his family and died when that love became too painful. 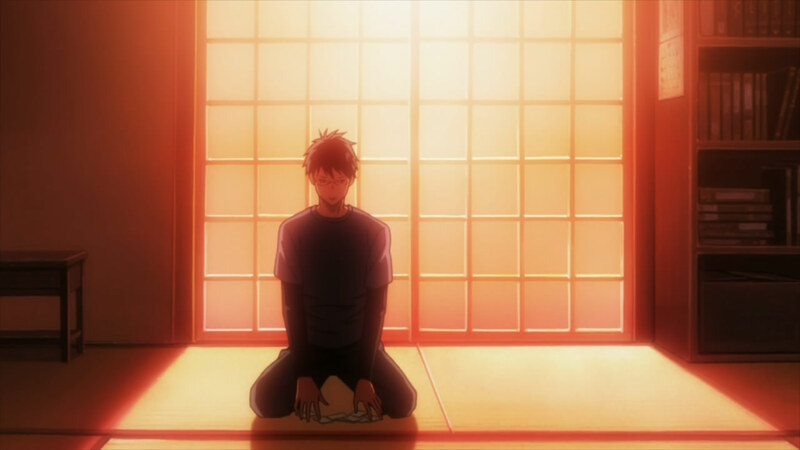 Is his love for Chihaya and even friendship with Taichi enough to rekindle his love for Karuta? All signs point to yes. 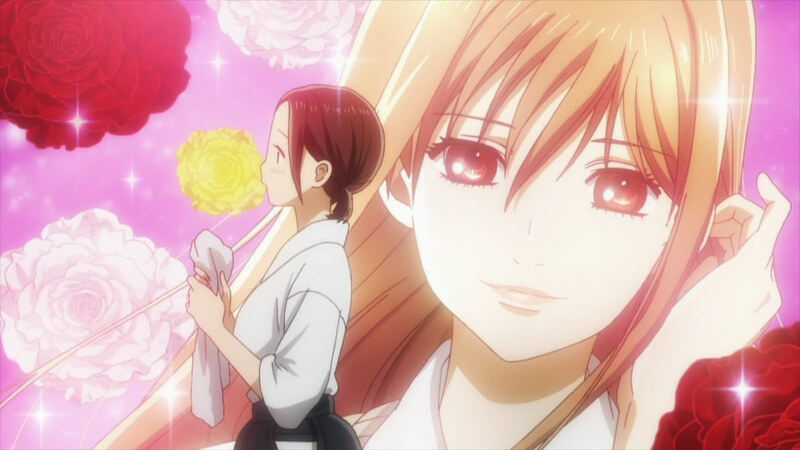 It’s easy to overlook when this series is overshadowed by flashier and more popular visual feasts like Fate/Zero and Guilty Crown, but Chihayafuru is a truly gorgeous series. Every character design is distinctive and expressive, Kanade being no exception. The landscapes and interiors feel rich and alive. And I love the way the flashbacks and mental images are woven into the look of the show, lovely images of Chihaya as a catalogue model and of ancient princes and shoji screens, and imagined visages of feared school advisors. It all creates a distinctive look that’s totally won me over. Also, lillies? Seriously? They aren’t even going to make me work at it, are they? Idk about that, Chihaya with that hairstyle in the library was pretty amazing. I’m really loving this series so far. I find myself salivating for new episodes every week, god knows how painful was to wait for this one and it delivered. Who else wants to know more about the Poems?! Me. I wish there is an english translation of the poems. Geneuinely interested. I do find the game itself boring, not a fangirl of poems, but they sort of make it interesting enough for me to want to know. I think the main problem with the series is that Karuta is the most boring game you could play. It’s just barely above the level of checkers. Feels like Chihaya plays with no class or poise. You can compare to other sports and games like basketball (slam dunk) go (hikaru no go) majong, baseball. In general, these games either have skill, teamwork, or intelligence. You have can have matchups that are interesting. In Karuta, you just memorize the cards and touch them the fastest…just can’t compare well. There is really not much of a team aspect either except if you call the 3v3 is so 1-D battle anyways. So we know that the Karuta isn’t going to get any more interesting. Chihaya’s denseness makes her similar to a female version of the generic male harem lead. She has potential to make the show but they aren’t living up to it. Taichi on the other hand is interesting, but is too halfassed, which is a huge negative. I don’t like how strong he comes onto Chihaya while he has a girlfriend. Would be much cooler if he just kept doing soccer rather than doing Karuta because now it is generic look for members development. Feels like too much of a tool. Arata is kind of boring as a Karuta nerd. So the question is if Chihaya, Taichi, Arata are interesting enough to keep watching. It will determine whether this series amounts to anything. Worst case scenario is it ends up like Hanasaku iroha where the characters get no development. 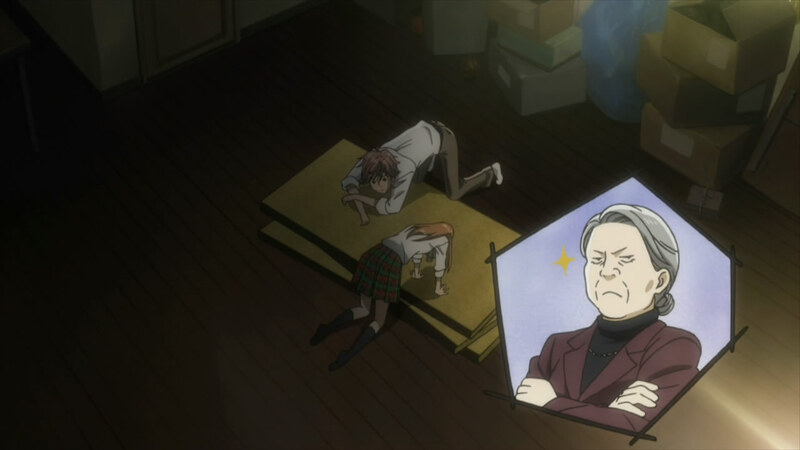 Best case would be Nodame where the characters themselves are interesting enough to watch for a season. Imo, you’re setting your expectations way too high. Anime/Manga has been made for several decades. Think it’s only fair to assume some tropes will be used over and over. Also, I really hate to say this, but people really need to stop pulling the “Karuta is boring” card. Yes, real life Karuta is boring. 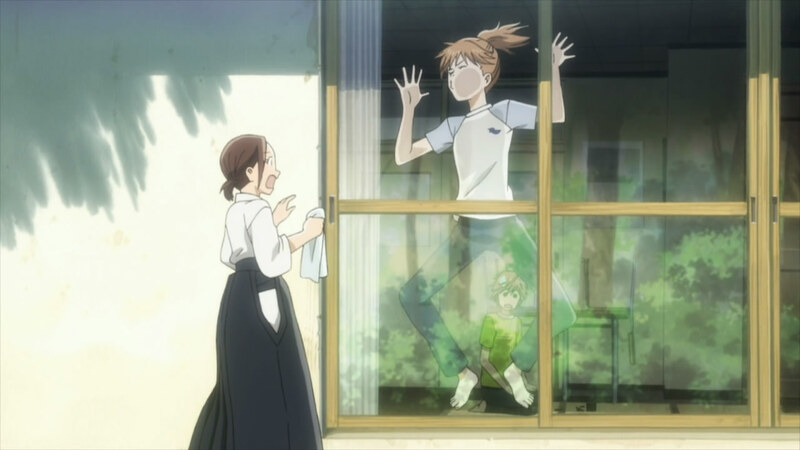 Chihayafuru uses it more as a medium to connect the main characters. It shouldn’t be viewed as a reason to watch the series unless you’re a huge Karuta fan/player. I prefer to watch animes that are interesting. That involves anime characters doing things that I find interesting or making things that are uninteresting appealing. That said Karuta = fail. Not hard concept to grasp. TBH I think I have fairly low expectations compared to the rest of the people watching this series. I have no problems with animes sticking to generic development but if they do that the show must be interesting to watch. We obviously know they are now in the hunt for members phase. Are the new characters going to make the group special or not? Personally I think they are overshadowing too much with “chihaya radiance”. 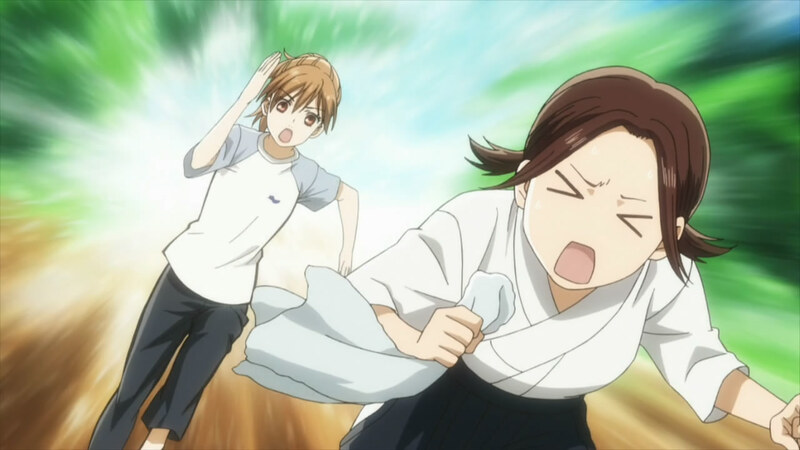 So you don’t like Chihayafuru because it can’t make Karuta (which again, should not be treated as the main appeal of the series) appealing past slapping cards at superhuman speed? Seems like a pretty shallow reason to dislike it. And despite the fact you’re willing to criticize the show, it just feels like you’re watching a completely different series. No I am questioning whether the show is headed in the right direction. Will their Taichi>Chihaya>Arata relationship develop or remain at the current impasse? Will the new club members be interesting and dynamic or is this show mainly to showcase a muda bijin? I am merely stating karuta has nowhere to go so it has to be about the people. Like for example Hanasaku iroha is a lesson in failure. They start with a pretty promising cast of characters and instead of developing the characters they try to make “running an inn” interesting. Ultimately “running an inn” is a failure in terms of being interesting and the characters were not developed and it was a clear failure in terms of what it could have been. Imo, self discovery is a better term to describe Hanasaku Iroha’s theme. Less negative connotation. 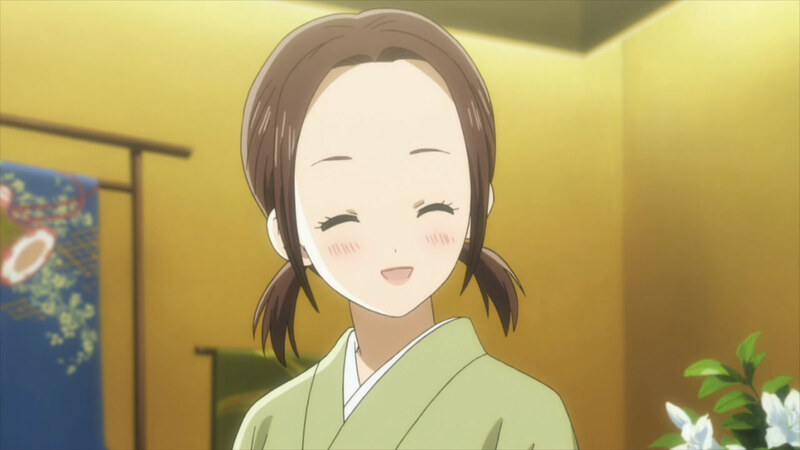 Interest in general is a subjective term and though Hanasaku Iroha could have done much better in the development department and focused more on the characters (particularly Ko-chan), it was still a decent series for what it was worth. 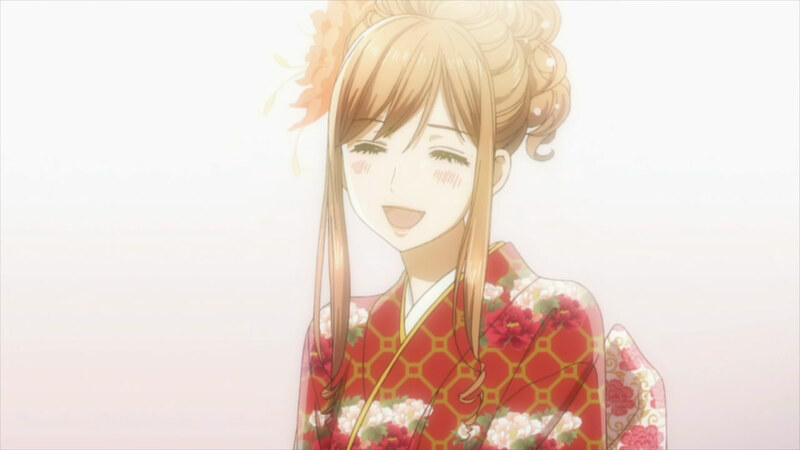 Back to Chihayafuru, if the issue is the characters, again, it seems like you’re hating the characters for all of the wrong reasons. We’re 6 episodes in on a 2-cour series. There’s plenty of room to develop the characters. Personally, I think the character development has been quite good so far and as I said, goes much deeper than the one-sentence descriptions you’ve provided. 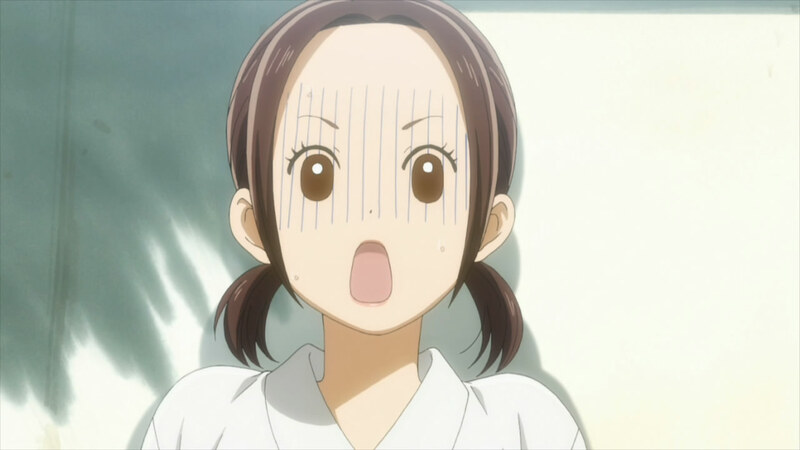 Are some things unrealistic, such as Chihaya’s dense, audacious personality? Yes. That’s part of the fun. I have watched the series same as you and I am just offering my take on what their interactions are like. I call Taichi half-assed because he is half-assed. It is a question of what the character’s appeal is. 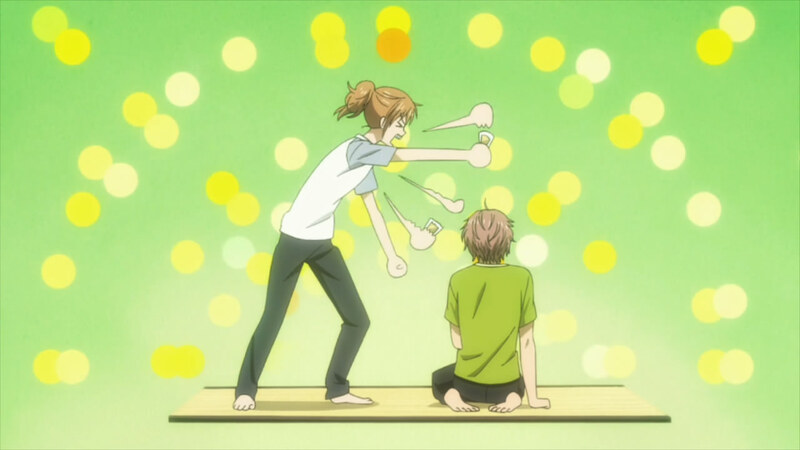 For example, Arata’s appeal is supposed to be his straightforward passion for Karuta. I am sure we will see that again. 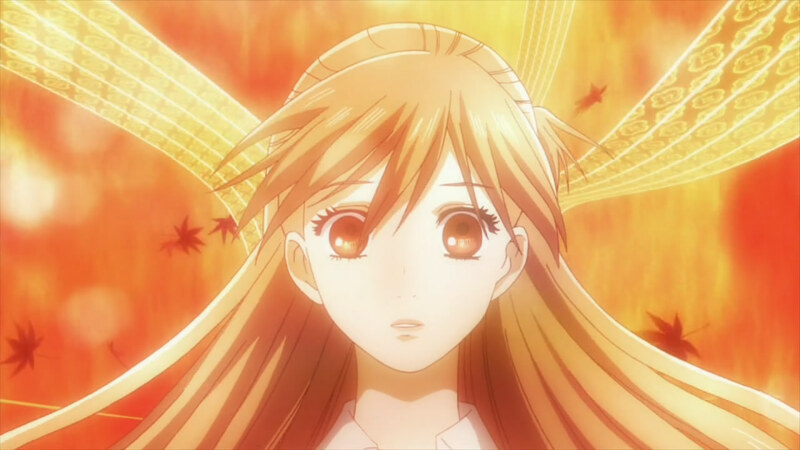 Chihaya’s appeal is supposed to be her beauty, innocence, and off personality. 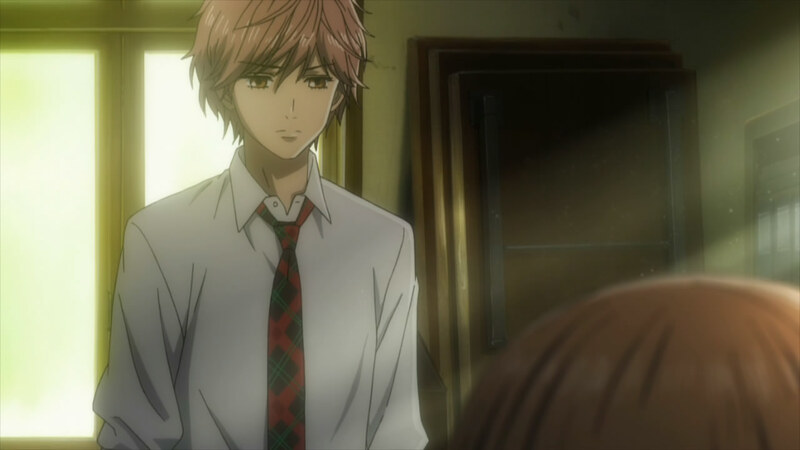 Taichi’s appeal is his attraction to Chihaya. He apparently developed into a possibly “school idol”/”honor student” character but it doesn’t seem like he is going to play this aspect. In terms of characters, I think that Taichi will pretty much make or break the series. He has been shelved into a supporting role in the hunt for members. I am sure his feelings for Chihaya will come into play again, but without him the series lacks much depth. It is currently relying too much on Chihaya. I am sure there are those that liked Hanasaku and for others it was just a waste of time. 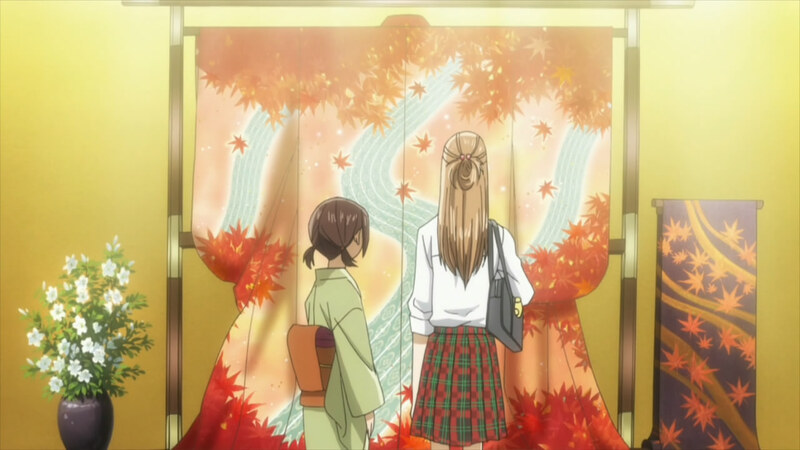 The maple leaves and river visuals when Kanade started to explain about Chihaya furu poem is simply breathtaking. 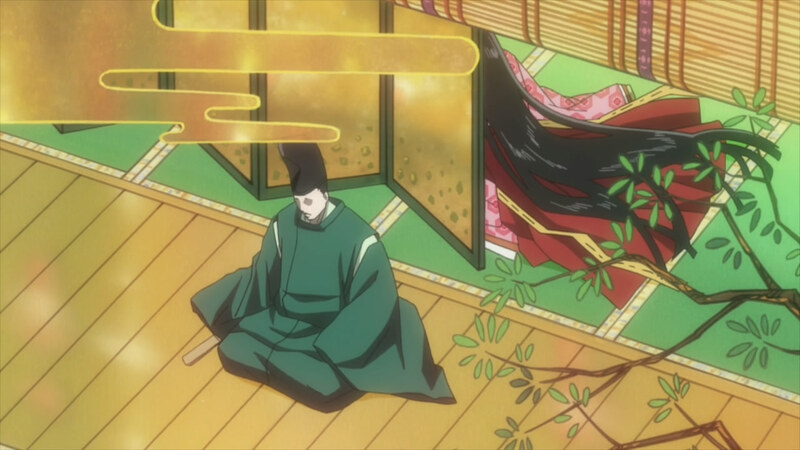 Madhouse when they are serious is probably one of the best studios at utilizing visual imagery to make these explanations scenes that could easily turn into infodumps look otherworldly and immersive (check out Mouryou no Hako for another example). And I thought Hanasaku Iroha looked good..
Haha Chihaya running into that window caught me by complete surprise, laughed hysterically. Slapstick humor ftw. Since the scanlated chapters never made this far YET, it really was a treat to get entertained without knowing what awesome things were gonna show up on the awesome episode. Slice at it’s finest. This is on par with honey and clover for me, and I really loved that one. 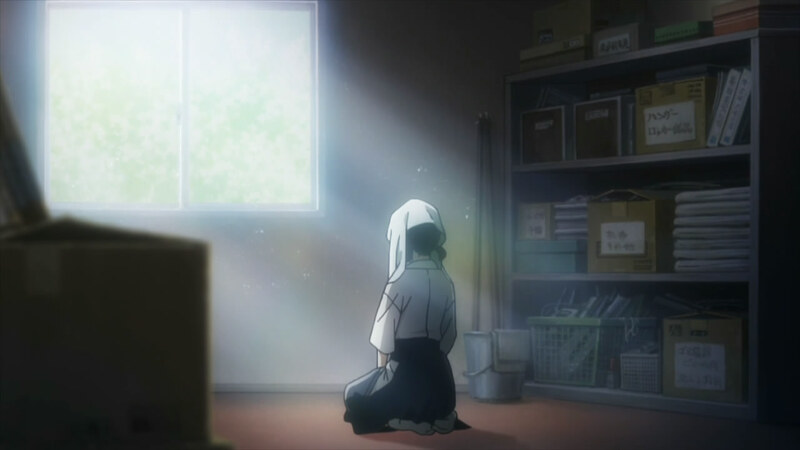 How one can make karuta this interesting is a testament to the writers and director this show has, it’s a MASTERPIECE! My favorite of the season with a slight leg up on Persona which I also can’t get enough of. Been a good season for me, alot of shows that are becoming some of my favorites I’ve seen, with Chihaya at the forefront. Wonderful. Kind of sad that its not the “go over the top” type of play ala Saki. I imagine it would be quite more interesting if there were stuff like an old man whose play style is to sit cross armed and seemingly without moving or moving his hand at shoulder level, throw the cards out through blinding speed or pure wind force respectively. Or a sneering middle aged player who looks down on those who throw more than 1 card out which is also his play style. Or a adult woman who carries a crystal ball that she believes shows the card that will be next or the kid who looks arond and munches on snacks while selecting cards without a look, depending on his or her pure luck. As it stands it s really more about their relationships than the game. 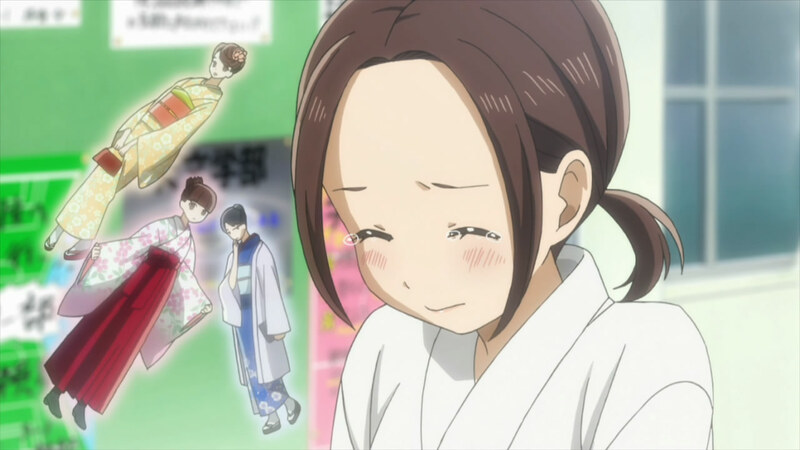 I’m guessing that Chihaya will be asked to become a model after she shows up in traditional clothes at a tournament and just being asked will trigger her sister’s rage, which we will then look at Chihaya’s family problem and her reason for playing. This show is fascinating. While the game itself is mostly a curiousity, the drama that Chihaya generates makes for an interesting show. And the show’s creators have done a great job so far with it. One of the peculiarities of it is that while I think that Chihaya must be the most beautiful girl in the world, the artwork of her doesn’t often deliver that. I’m not sure how they managed to do that. I find the way they colour her cheeks to be distracting — not so much because they’re often flushed but by their use of such hard, vertical lines. And poor Taichi. The one time the artists delivered, he has to gaze at this woman he’s in love with, while she’s crying her eyes out and radiating such raw emotion that it must be like staring into the sun for him. I thought it was funny while Oe was distressed over the lack of a model for their catalogue, even while she’s sitting a foot away from Chihaya. 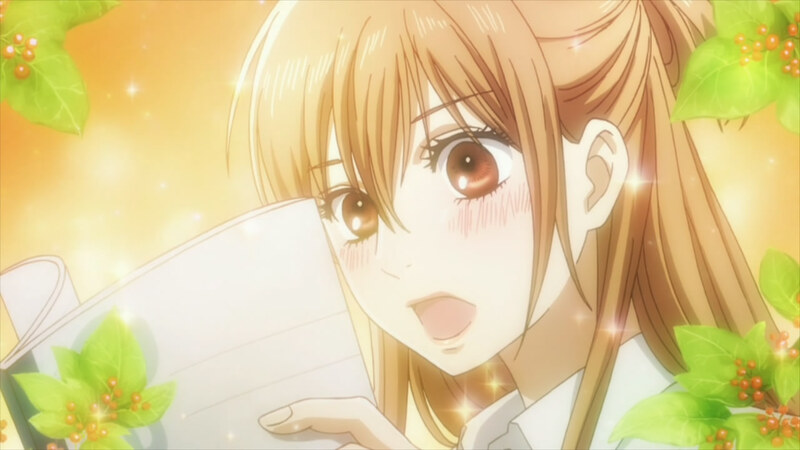 And I liked how she was able to impart some of her passion to Chihaya. 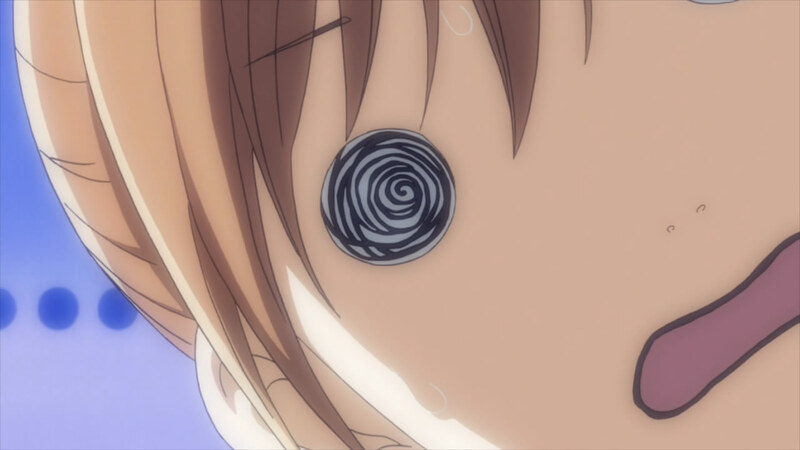 And it only happened because of Chihaya’s own crazy will. This show has been great to watch so far and they’ve set it up so that it can go in many different directions. I really like watching Chihaya but the Arata flags and Taichi being pushed aside just keeps getting more and more uncomfortable for me. This show is definitely one of my favorites this season. 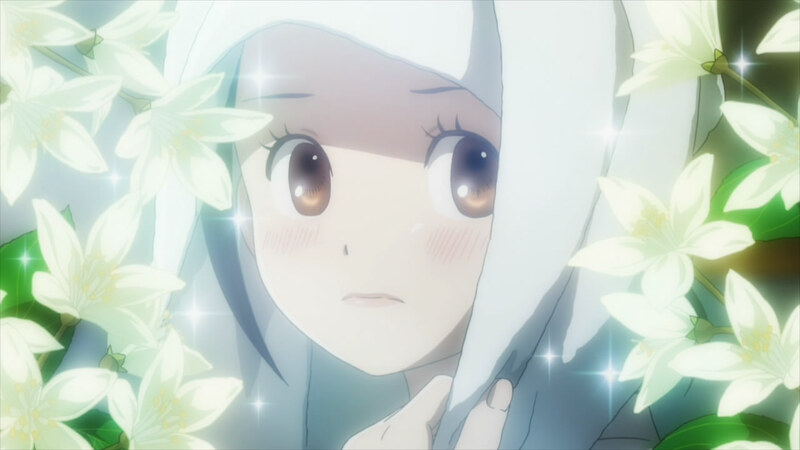 I’m typically not into Shoujo art, but really this anime is really pretty. 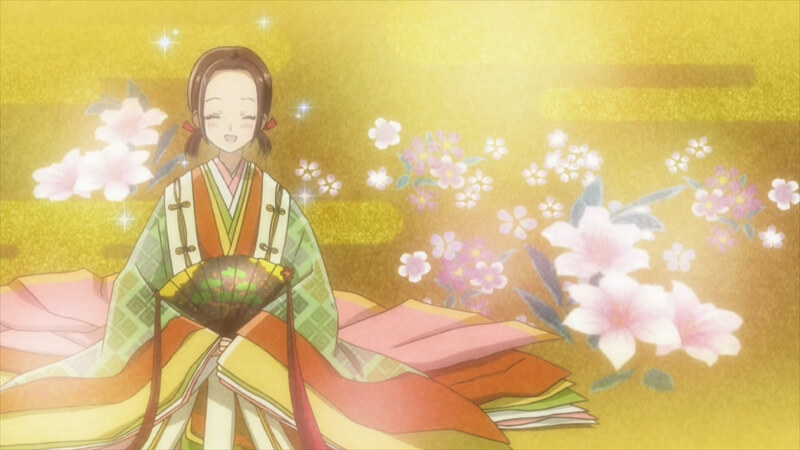 Chihaya is an paragon of beauty, especially in those colorful kimino pictures. For Kanade, she’s cute for now, but I hope she will be developed well. I’m not sure how to develop a character like that, other than breaking her love for history or something like that. JHowever, I do get yuri vibes from her to Chihaya. Lol. As for Taichi, he’s still my favorite and I’m rooting for him! I’m pretty sure it was the karuta teacher that told Chihaya about becoming friends with the cards when she said she couldn’t remember most of them. Excuse me for my denseness, what does the Arata flag imply? >_<? I believe it was when they told chihaya that her card was actually about love. And then it switched to a scene of Arata. Also the deep red light behind Arata implies a lot. I think this show has broke my personal record of not-being-impressed-with-anime-adaptation-of-manga. I enjoyed the anime but the manga, woah… nah. This is what my friend used. Not sure if it is helpful but hope it suits your needs. 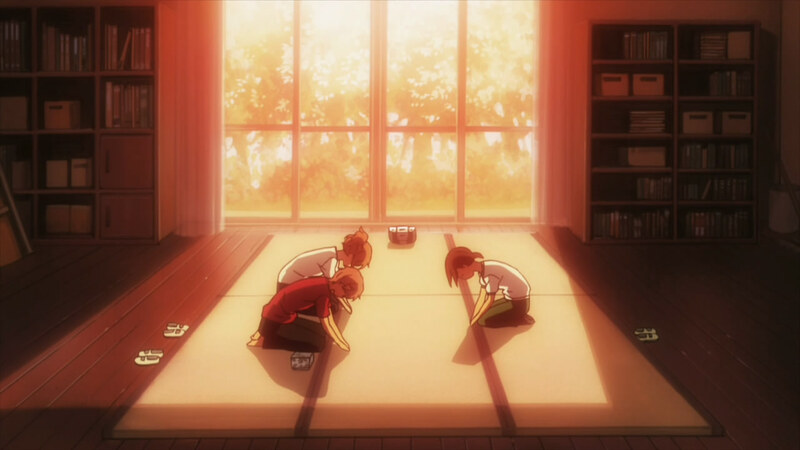 I would love to play Karuta and teach someone else so we could learn together. But I think I’d have to learn Japanese first, then learn it’s history from Ooe Kanade, then try to convince someone else to learn it. lol What a lost cause.. I’m better off wingin’ it in Mahjong. It looks at least fun to try, well at least this anime makes it look fun. The Chihayafuru update, with its colorful screenshots, looks and feels aesthetically pleasing along with the banner when you open the main page. Just sayin’. That does go well with the banner, doesn’t it? Pure coincidence, though the screenshots for this show are always gorgeous. 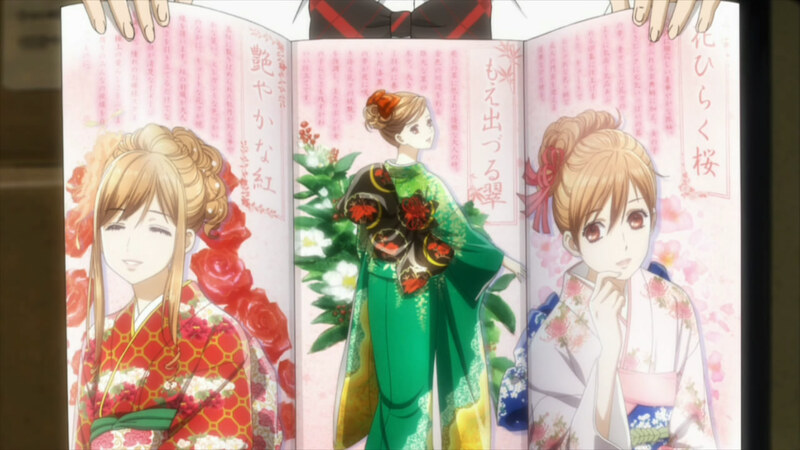 Make the banner Chihaya wearing that red kimono. 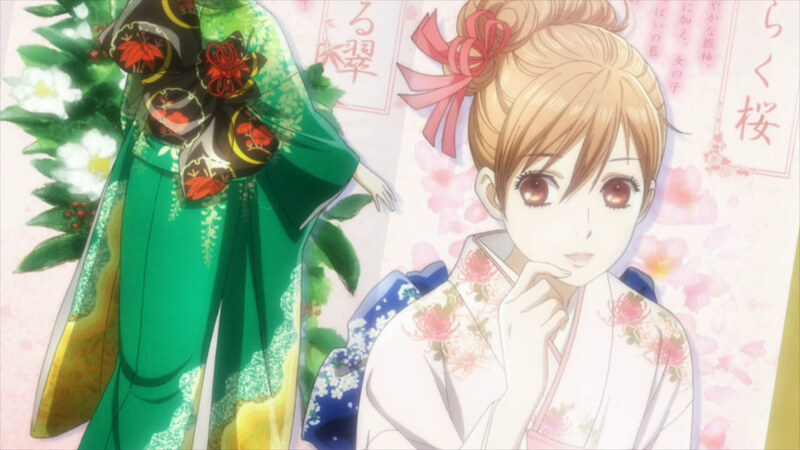 LOLz at the Imagine Spot of the new character when she imagines Chihaya as an aristocrat. Its a term typically for eroge/VN where you make choices that lead to certain events which are called flags because they signal that you made an important choice. Say in the game you choose to eat lunch on the rooftop and then you meet a girl and she invites you on a date. Later on this flag will be important because the date was a prerequisite for ending up in a relationship with the girl. Something that caught my attention and deepened my impression that Chihaya is still quite a tomboy – it seems she prefers to wears the boys school tie, and not the bow like the other girls. Even in the classroom. She reminds me of myself of the high school who took the national literature a little bit deeper than average student. The stories behind the stories, the historical background, the hidden meanings. Is this series 13 episodes long or 26? I keep seeing different numbers everywhere.